We’ve been to Walt Disney World many times since my boys were little, and I am glad they finally updated Magic Kingdom with the New Fantasyland. I’m a Disney traditionalist. I love the original characters and warm up slowly — very slowly — to new princesses. I’m still not a Vinylmation fan, and I did not expect to like the New Fantasyland — needed or not. After all, they moved DUMBO! I just couldn’t picture myself liking the new look as I passed through Cinderella Castle into the New Fantasyland without Dumbo being right there. Alas, I worried for nothing. I didn’t miss Dumbo, not one little bit. In fact, I think the Carrousel stands out more magnificantly without the big ears — Dumbo’s big ears, that is — peaking out from behind. 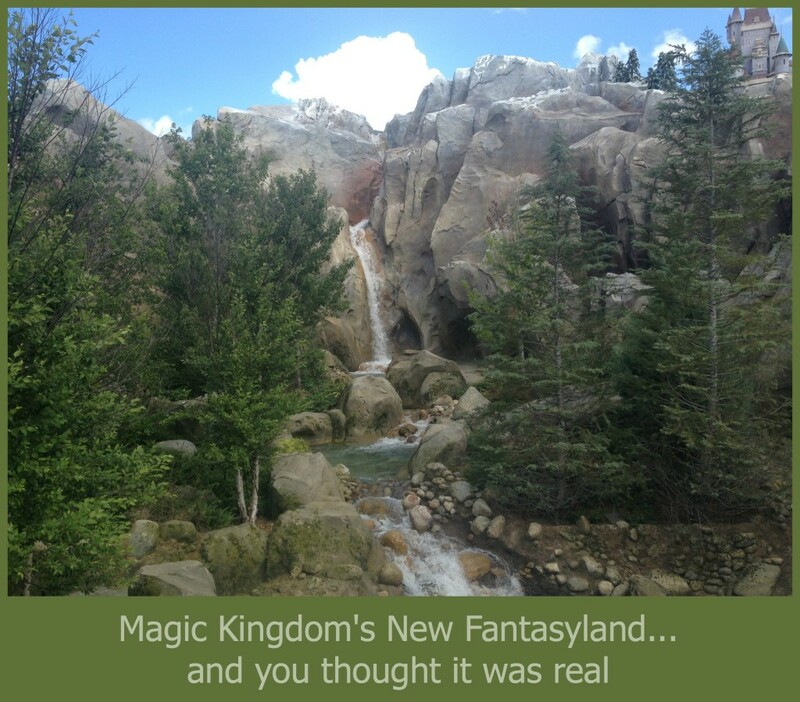 What makes the New Fantasyland special? Disney imagineers must have had people like me, skeptics?? ?, in mind when they designed the New Fantasyland. It’s simply amazing — as anything Disney should be. Here are a few of our favorites. New Fantasyland is artfully constructed. Behind the carrousel, there’s a grand entrance with wide walkways that screams Belle. The cobbled walkways, evergreen trees, and even the buildings look like they were pulled from the pages of Beauty and the Beast. 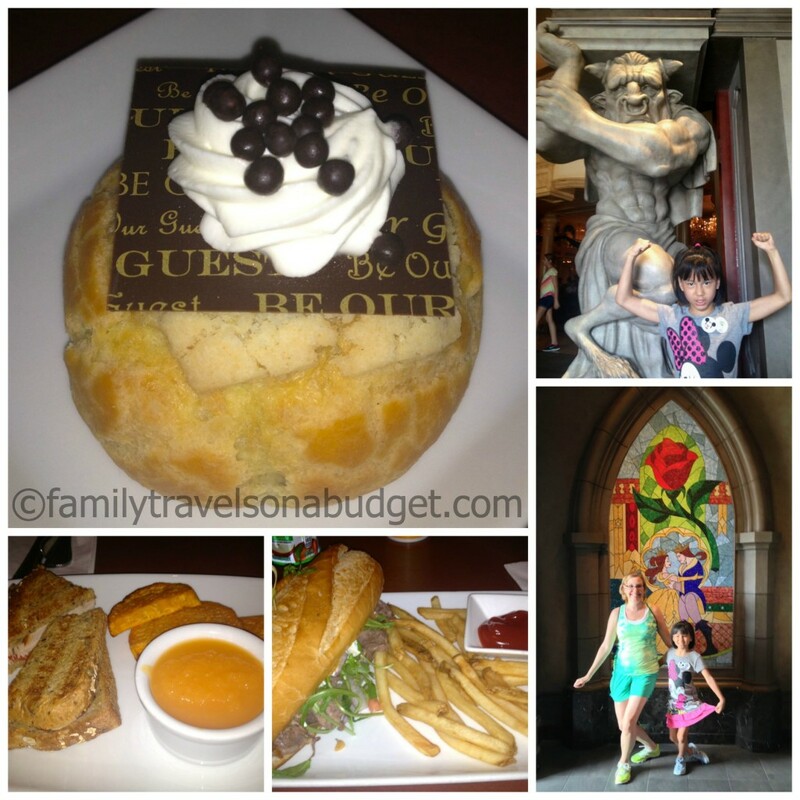 The area boasts two restaurants: Gaston’s Tavern and Be Our Guest. It’s also the new home to Enchanted Tales with Belle, where kids become part of the story. Pass through Belle’s area to be instantly transported to Ariel’s world, Under the Sea. The new queue for Ariel’s Grotto offers shade and fans to keep young mermaids cool (cooler?) as they wait. It’s also home to the new Under the Sea attraction, with a queue as fun as the ride itself… well, almost! What makes it so fascinating, though, is these two areas back up to each other yet you can hardly tell. Just head to Under the Sea and look back to Belle’s area. You will be amazed! The photo on the left was taken in queue for Under the Sea… no evidence of pine trees directly behind! Pure Disney imagineering magic! 2. The restaurants are great for young families. Gaston’s Tavern serves enormous — and tasty — breakfast treats. We got three cinnamon rolls and had plenty to share among the five of us (including two teen boys). The dining areas are small, so the noise is lower. And the decor is hilarious! Be sure to look around. Be Our Guest, which provides table service dining for dinner (if you can get a reservation, you are quite blessed!). From 11 a.m. to 4 p.m. it offers quick service dining for guests. The restaurant has three dining rooms — and most people stop at the first one. For a quieter lunch, head through the main room and dine in the room to the right. We enjoyed enormous portions in a quiet dining room away from the Magic Kingdom madness. The line for lunch starts before the restaurant opens, so plan ahead! We enjoyed the thoughtful touches Disney Imagineers included in the New Fantasyland. Perhaps designed with kids in mind, the New Fantasyland is great for parents and families too. My teens look forward to visiting next summer when the Seven Dwarfs Mine roller coaster opens! Allow 2-3 hours to fully explore the area. Fast Passes for the Under the Sea attraction are available at Mickey’s Philharmagic…. the queue is nice and all, but not waiting is even better! Have you been to the New Fantasyland yet? What did you like best? Glad the post helps. Please check our Disney Planning Guide when you decide to go back. 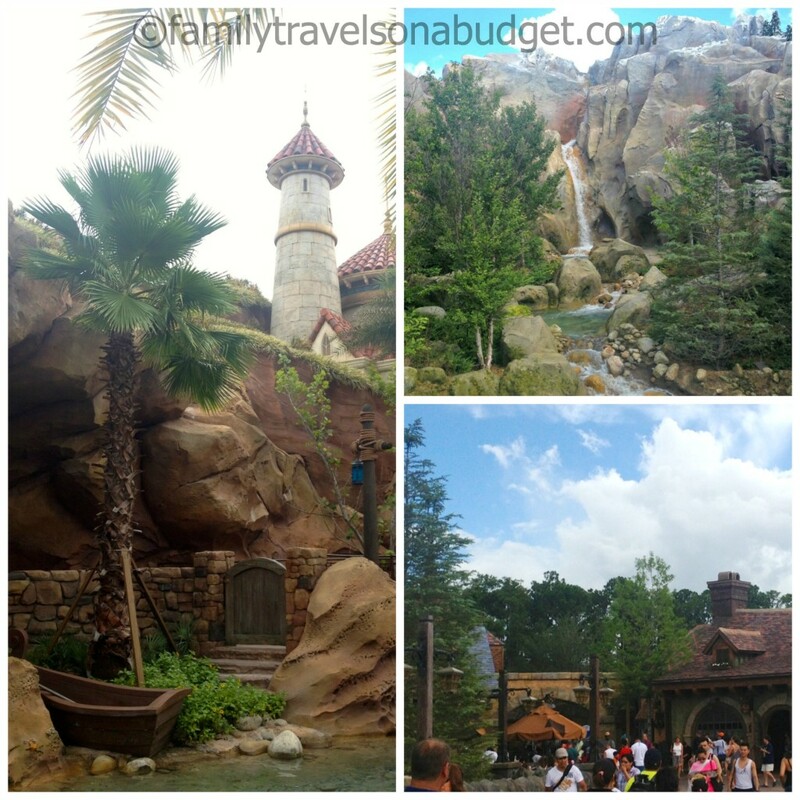 Lots of useful tips and such to make planning a Disney vacation easier! What fun. I haven’t been to WDW in years and was wondering how the new area looked. That sandwich looked great too! Yum. The sandwich was excellent! Tender roast beef and flavorful sauce — I think it had a bit of horseradish in it, but it wasn’t overpowering. Huge portions too! I went to Disney on Florida as an adult when visiting my Mom–we only really went to Epcot-which I did enjoy!-Wait–I went to Florida with a friend and we stood outside and watched the fireworks–Fantasyland looks really cool! That’s a fun way to watch the fireworks. We rode Big Thunder Mountain Railroad during the fireworks was quite a thrill. They shoot the fireworks off nearby so they’re large and close. We’ve never been to Disney! That looks like so much fun! It was fun. Once the Seven Dwarfs roller coaster opens, teens will be happy!